The 'Late Night' comedian hosts the 75th Golden Globes Jan. 7 amid a sexual harassment reckoning that stretches from Hollywood to Washington. Nearly three years ago, Tina Fey and Amy Poehler launched scathing, dueling impressions of alleged serial sexual predator Bill Cosby during their third and final Golden Globes hosting stint. 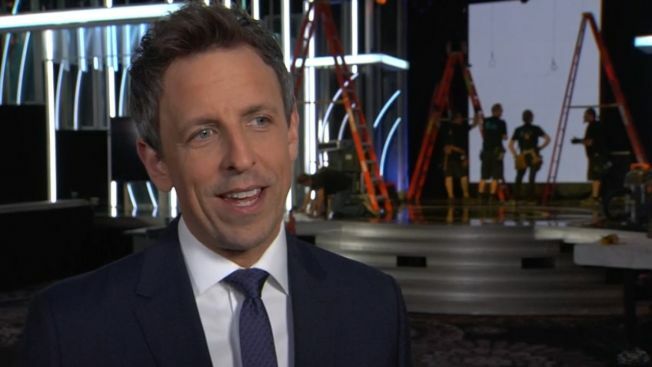 In October, Fey and Poehler's former "Saturday Night Live" colleague Seth Meyers took a different approach while tackling reports detailing allegations of sexual assault and sexual harassment against movie producer Harvey Weinstein. Meyers turned over a segment of "Late Night" to three women on his writing staff – including Amber Ruffin, who mocked Weinstein’s defense of being a product of outdated workplace behavior expectations. “Does he lose his s--- every time he sees a microwave?” she asked. Now Meyers jumps from the microwave into the fire as he takes the stage alone Jan. 7 to host the 75th Golden Globe amid reports of rampant sexism, sexual harassment and worse stretching from Hollywood to Washington. Meyers' steep challenge: skewering entertainment world power abusers on their own turf without appearing to mock the horror suffered by countless victims. It would easier just to get up and make jokes about President Trump – something the former "Weekend Update" anchor has drawn notice for with his "A Closer Look" segments. Some believe the in-person lampooning spurred the "Apprentice" star's presidential campaign, though Trump later denied it. The Globes gained new prominence – and scrutiny – in 2010 when Ricky Gervais first hosted and spouted controversial cracks like, "I like a drink as much as the next man – unless the next man is Mel Gibson." Last year, Jimmy Fallon put on an entertaining, if less pointed show in the days before Trump took office. The strongest model for Meyers may be the Fey-and-Poehler team, which largely avoided scattershot barbs while surgically targeting the once-beloved Cosby. “I put the pills in the people, the people did not want the pills in them,” Fey said in her best Cosby voice. Meyers will have to find his own voice as he takes on the Golden Globes at a time when the host needs to be more than just funny.